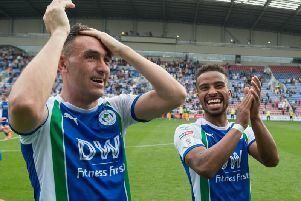 Wigan Athletic manager Paul Cook has sat down with Sam Morsy this week in an attempt to keep his skipper on the field for the entire relegation run-in. Morsy’s yellow card at Derby on Tuesday was his 13th of the season - no player in the EFL has more - and he is only two short of a third ban. That would potentially rule the Egyptian international - Cook’s on-field lieutenant - out of three games of the relegation run-in. And the boss is desperate to avoid that scenario if at all possible. “Without going into too much detail, to say I’m not happy about the situation is an understatement,” acknowledged Cook. “I’m sure you’ll appreciate we don’t have to speak about certain stuff. “But that is one of the things that will be dealt with the utmost urgency. “Sammy’s been my captain now at two clubs, and everyone will know how strong our relationship is. “We do not need to be losing our best players through ill-discipline.